NASA’s Commercial Crew Program, which is working to enable private contractors to transport astronauts to the International Space Station, has taken a step closer to crewed flights. The two prime contractors have conducted the latest round of tests of their spacecraft parachute systems. The two prime contractors are Boeing with its CST-100 Starliner spacecraft, and SpaceX with its Crew Dragon capsule. Both hope to send astronauts to space as early as 2019, but their first uncrewed tests could happen before the end of 2018. The latest round of Boeing’s Starliner parachute tests occurred in February 2018 when a Boeing C-17 Globemaster III aircraft carried a dart-shaped test bed module and released it over Yuma, Arizona, testing the flight drogue and main parachute system. Two more tests are planned with the dart module. After that, NASA said Boeing plans to conduct three reliability tests using a high-fidelity capsule simulator, which should precisely mimic the CST-100’s mass and aerodynamics. This is designed to be accomplished using a helium balloon to lift the simulator to an altitude of more than 30,000 feet (9,100 meters) and release it to evaluate parachute deployments as well as overall system performance. In May 2018, Boeing is slated to conduct the third of five scheduled tests using the same kind of helium balloon. The spacecraft will be lifted high above the desert over New Mexico and dropped from a height of 40,000 feet (12,192 meters). That test’s sequence of chute deployment will be the first three pilot chutes, then two drogue and finally, the three main chutes, NASA said. Various tests are performed to simulate different deployment speeds and the effects of different weight demands. This information is then entered into computer models in order to predict parachute performance in different situations and to evaluate consistency from one test to the next. 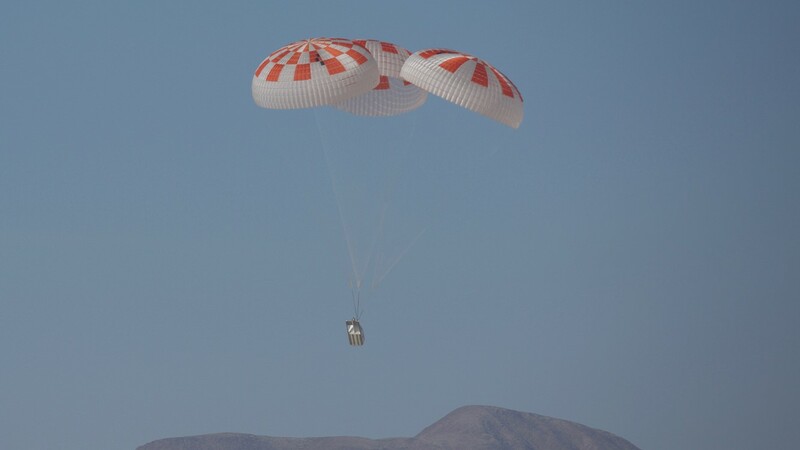 The most recent SpaceX parachute test for its Crew Dragon spacecraft was conducted on March 4, 2018. A Lockheed C-130 aircraft carried the test vehicle to an altitude of 25,000 feet (7,620 meters) and dropped the test vehicle. In order to simulate an off-nominal situation, only one of the two drogue chutes deployed. Then a deployment stage was skipped on one of the four main parachutes. According to NASA, the objective of the test was to prove that the capsule could make a safe landing under such circumstances. In the next round of Crew Dragon parachute tests, a Lockheed C-130 will again drop the test vehicle from an altitude of 25,000 feet (7,620 meters), but in a different off-nominal configuration. It will involve skipping the deployment of one drogue chute while one main chute will fail to deploy. NASA said the goal of these off-nominal tests is to confirm that astronauts can survive landings when even if one or more parachutes fail. 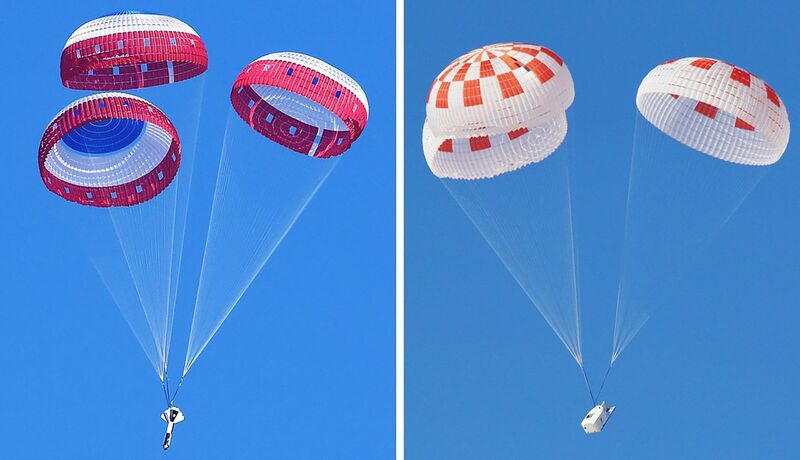 “We test the parachutes at many different conditions for nominal entry, ascent abort conditions including a pad abort, and for contingencies, so that we know the chutes can safely deploy in flight and handle the loads,” NASA engineer Mark Biesack, who oversees parachute testing for the Commercial Crew Program, said in an agency news release. Kathy Launders, who runs the Commercial Crew Program at Kennedy Space Center in Florida noted that SpaceX and Boeing are “making great strides” in their parachute test program and that the data they are collecting is critical to insure their respective systems work as designed. “NASA is proud of their commitment to safely fly our crew members to the International Space Station and return them home safely,” Launders said. But whose parachutes look the coolest? Anyone know the dates the previous parachute tests took place for SpaceX and/or Boeing? Thanks. The last SUCCESSFUL TEST FOR BOEING WAS IN OCT 2017 and MAR 2017.